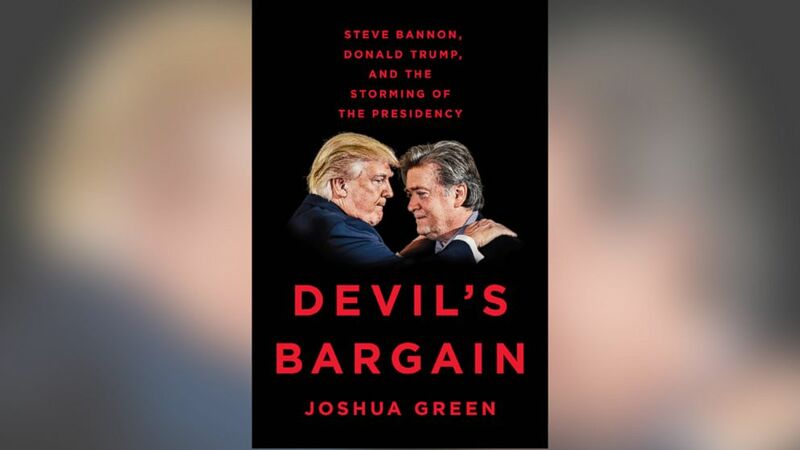 This most recent book of Joshua Green’s focuses mostly on Steve Bannon and fleshes out his bargain with Donald Trump. The bargain: Bannon’s hard-right nationalist politics would carry Trump to the White House. This book, Devil’s Bargain, is a book you won’t want to put down, and there will be times when you are apprehensive about what you will read next. It will give you hours of material for political dialogue. However, it will leave you aghast at how this shocking campaign and subsequent election played out under our very noses, one calculated media event after another, and at how many fell for it. How did this happen? That is the question that drives this book. Steve Bannon is a crucial piece of the puzzle. Devil’s Bargain is more synthesis than analysis, and credited as even-handed, even by Trump supporters. Joshua Green first met Steve Bannon in 2011. In his words, he “quickly sized him up as a colorful version of a recognizable Washington character type: the political grafter seeking to profit from the latest trend.” Green, an investigative reporter, is the former senior editor of the Atlantic and a weekly political columnist for the Boston Globe. He spent several years immersed in right-wing politics. Devil’s Bargain is based on a prophetic story Green wrote for Bloomberg Businessweek in 2015 titled, This Man Is the Most Dangerous Political Operative in America: Steve Bannon runs the new vast right-wing conspiracy – and he wants to take down both Hillary Clinton and Jeb Bush.” How implausible this article must have seemed at that time, when we couldn’t even entertain the idea of Trump being chosen as a presidential candidate. How much we all had to learn. Steve Bannon and his various political and media connections over the years support his ideological/political journey. A proponent of the Tea Party, Bannon had previously focused on supporting Sarah Palin and Michele Bachmann. In 2011 he made a film about her called “The Undefeated”. That was about the time he was introduced to Donald Trump and began to advise him. Trump is presented as the vehicle through which Bannon’s ideology is to be made manifest. Where it doesn’t say much about Bannon’s personal life, it tracks his populist-nationalist ideology and its development through his life. Bannon was in the Navy for seven years and then set his sights on Wall Street in support of Reaganomics. He was admitted to Harvard Business School where his working-class roots set him apart from his well-heeled classmates. He excelled academically and was hired by Goldman Sachs, to be followed with a stint as a Hollywood mogul having a stake in the TV show, Seinfeld. Back in LA he met Andrew Breitbart, who became his next guru. He took over Breitbart News in 2012 after Andrew’s untimely death and ran it from his apartment. Bannon discovered the underworld of online gamers: specifically “World of Warcraft”. He intuited its digital world could be recreated for political purposes.by waging an end-of-days battle against jihadists, progressives, the Clintons, etc. It was for Breitbart that he hired Milo Yiannopoulos the man he felt could connect the “millions of intense young men gamers” waiting to support his ideas. The ammunition for his attack on the state would come from Breitbart News and the Government Accountability Institute. The GAI had dug up dirt on the Clinton Foundation for Peter Schweizer’s 2015 book Clinton Cash, a project Bannon supported. GAI was also advising on how elections and public opinion could be affected by psychological warfare. Bannon’s genius was to pitch the disputed but troubling revelations in Clinton Cash (ammunition) to mainstream media, not right-wing outlets. It worked. “We’ve got the fifteen best investigative reporters at the fifteen best newspapers in the country all chasing after Hillary Clinton,” Bannon said. His ability to strategize the media was paving the way for a Trump victory. Bannon’s hard-edged ethno-nationalism and his elaborate, years-long plot to destroy Hillary Clinton began to affect public opinion, especially amongst the base that he wanted to attract. In Bannon’s opinion, Trump’s candidacy was timed perfectly for the populist insurgency that had been building up in America for years. Bannon believed he would change the world. Bannon became Trump’s campaign manager in August of 2016 at the behest of the Mercer family. Commentators said that Bannon would take the campaign to a dark, racist, divisive direction and Republicans would run away. They didn’t. Trump’s success, per Green, is largely due to Bannon using the candidate as a vessel for his nationalist ideas. Interestingly, Bannon’s advice to Trump after his campaign was accused of anti-Semitism was: “Darkness is good. . . . . Don’t let up.” We all experience that darkness day after day. Bannon labels himself a Leninist, who wants to destroy the state. We truly do not know where Bannon’s influence will lead, or what his actual impact will be on the President and on our nation. The book comes to an abrupt end in June of 2017. Are we in for more darkness?